There are 2 enticing Bonus Features for players. The first is the Griffin's Rage Bonus Game where players join the hunt for the Invisible Man in 3 locations with an exciting Pick and Click style game delivering coin prizes and multipliers. The second feature is Police Spins where the Police close in on the Invisible Man during three bonus spins with 4 Burning Wilds appearing randomly on the reels meaning huge wins are bound to happen! South Park™Reel Chaos is a 5-reel, 3-row, 20-line video slot in which fourth graders protect the city from Professor Chaos and his evildoers. Our awesome heroes bring it all – Stacked Wilds, Multipliers, Multiplying Re-Spins, Overlay Wilds and Running Bonus Spins! Follow this justice league of nine year olds through 4 mini-features that will lead to the big showdown, Epic Bonus Spins. For every defeated enemy a bet line multiplier increases, giving up to 4 times the bet line win. If all villainous baddies are defeated a sweet Victory Bonus is rewarded. Go Bananas! ™ is a fast-paced 5-reel, 3-row, 20-line game featuring 5 different Wild Monkey symbols. Set in a tree house in the tropical jungle with mischievous monkeys, juicy fruits and glimmering gems, the game offers big win chances packaged with fun and sun. Whenever any of the 5 Wild Monkeys appear on the reels, they turn adjacent symbols into Wild symbols. If there is a win, the jovial monkeys come to life and celebrate the gain. This colourful video slot really gives the player an action-packed game with a monkey twist - so let’s Go Bananas! Attraction™ is a 5-reel, 3-row, 10-line video slot featuring the Magnet, the main feature of the game. The Magnet feature works together with the Wild symbols to activate Sticky Wilds and Re-Spins. During every spin of the game a magnet appears on a random position on the outside edge of the reel frame. A beam of animated pulsing light helps the players see what position the magnet is on. After an electric shock, an animated ball of electricity shoots out of the Wild and towards the magnet, transforming all other symbols in its path into Sticky Wild symbols. The Wish Master™ game features the exciting Wish Master feature, with a genie escaping from its bottle whenever a Scatter appears, to activate an exciting feature. The features that can be activated when the genie comes out of its bottle range from x2 or x3 multipliers, expanding and randomly positioned Wilds, Wild substitution for selected symbols and even a whole Wild reel! When the features are activated the spin counter gets increased, meaning the features are active for as long as there are numbers in the spin counter. Lights™ is a mesmerising 5-reel, 3-row, 9-line game featuring Free Spins and Floating Wilds. This Zen-like game is set in an Asian landscape at dusk, giving a sense of flow with a seamless gameplay. During every spin, fireflies swarm the reels and create Floating Wilds on top of existing symbols. In Free Spin, as dusk turns into night, even more fireflies light up the game, forming extra Floating Wilds. So click the Spin button and follow these radiant flying jewels illuminated path to big win chances in every spin! Wonky Wabbits™ is a cute new video slot with rabbits for the theme and offers 5 reels and 15 paylines. All wins pay from left to right as well as from right to left and there is a wild duplication feature. The wild symbol which substitutes for all symbols will duplicate itself to the position that will create the largest win. Wild symbols appear on all reels, but the stacked wilds can only appear on reels 2 and 4. The maximum number of wilds that can appear on the reels after the wild duplication occurs is 14. Big Bang™ takes players into deep space, on an interplanetary trip to the far reaches of the universe with Wild substitutions and a progressive multiplier. The multiplier doubles winnings by X2, X4, X6, X8, X16, and up to a massive X32! If that's not enough to keep win anticipation at a high, imagine one or more Wild symbols completing a winning combination with a multiplier of X32. The possibilities for stellar wins in Big Bang™ are out of this world! Wild Water™ takes players back to far-out days of the 60's and 70's when beach bums ruled the waves. The game features Wild Substitutions, stacked surfer symbols, Free Spins and 2 different types of bonus wins. The bonus wins include Surf Team and Surf's Up bonus wins, each with its own bet multiplier. When a Surf Team bonus hits the reels, players are sure to notice the massive x200 multiplier. The Surf's Up bonus win pays a modest x20 multiplier. Wild Water™ offers players an energetic feature packed game where anticipation builds after every spin. Creature From The Black Lagoon™ is the latest released video slot powered by Net Entertainment in cooperation with Universal©. This Net Entertainment online video slot has 5 reels and 20 paylines and is based on the movie by the same name. This video slot features wild substitutions, sticky wilds, spreading wilds, free spins and respins. Wild symbols can appear randomly anywhere on the reels in the main game, and substitute for all symbols except for the Free Spin symbols and the target symbols. 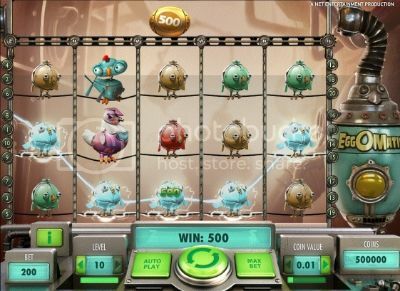 Aliens is Net Entertainment’s first casino slot game with real-time 3D graphics illustrating its commitment to innovation. The Search, The Encounter and The Hive, all elements taken from the 1986 classic movie, make up the three game levels that players must conquer in this truly spectacular video slot. There are up to x14 Multipliers in ‘The Search’ and x240 bet rewards for surviving ‘The Hive’.The film’s sinister beauty is captured perfectly within the game, which is full of unique win sequences that will keep players on the edge of their seats. Twin Spin has old-style Las Vegas excitement with the most innovative new-age slot technology. Each spin starts with identical, adjacent twin reels that are linked together. During the spin the twin reels can expand to become triplet, quadruplet or even quintuplet reels. The unique reel synchronizing and linking feature that appears on every single spin and the 243 ways to win ensures that players maximum level of excitement that they get every time they play Twin Spin. Additionally, the 3 mini-features add Wilds to the reels, with comic animations and authentic sounds combining to reflect the familiar chaotic and dysfunctional town of South Park™. Take a journey back to a time when Stonehenge was used by the ancient druids and unlock the mysteries of a stone garden in Secret of the Stones. The game features 5-reels, 3-rows, Wild substitutions and Free Spins. The game also features an interactive Free Spins bonus collection where players collect different types of bonus features for Free Spins. Secret of the Stones™ offers the highest quality gaming experience and is suited for players from all backgrounds. 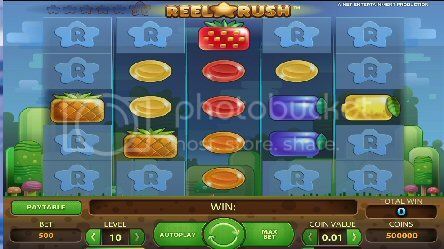 Reel Rush is the latest released video slot powered by Net Entertainment. This online video slot is the cascading type but with a difference, having a free spins feature. Reel Rush™ has 5 reels and 3125 ways to win during the free spins feature. Up to 5 re-spins can be awarded and then the free spins feature will be triggered and 8 free spins are awarded. When the free spins feature is triggered all of the reels will be filled with symbols and there will be 3125 ways to win. different turkeys and A, K, Q, J and 10. All wins pay from left to right. Three Wild symbols will trigger the Free Spins feature, and as mentioned above the Stacked Wilds can then appear on the reels, if this happens two additional free spins will be awarded. Space Wars™ is going to be a popular video slot with it's novel images and great graphics. This latest released video slot powered by Net Entertainment Gaming Software has 5 reels and 40 paylines with an outer space theme and a number of different aliens for the symbols against a backdrop of planets in outer space. There are Wild Symbols, stacked symbols and a free respin feature. In the main game and in the respin, Wild symbols only appear on reels 2 and 4, and substitute for all symbols. Initial bet line wins activate one free respin and are played on a different set of reels. When the respin feature is riggered, the winning symbol appears in the Cloning Pod. The symbol is cloned and the cloned symbols are then added onto the respin reels and the cloned symbol is shown stacked on the reels. Silent Run™ offers players all the excitement that comes with being in a submarine deep under the ocean. The game provides a perfect mix of authentic submarine sounds and graphics that creates the intense experience of being part of a submarine crew. The suspense increases as the Echo Bonus and Echo Wild symbols appear on reel 3 and the sonar signals search for extra Wilds or torpedoes. The action heats up in the Bonus Game when the player peers through the perfectly re-created periscope and fires torpedoes at enemy ships hoping to find the Premium Ship for bigger wins. The realistic naval graphics and sound effects coupled with an exciting Bonus Game and extra Wild feature guarantees that Silent Run™ players will feel that they are part of a real-life under-water battle. 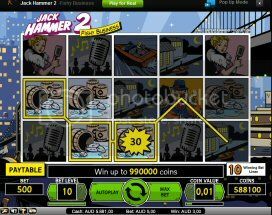 Jack Hammer 2: Fishy Business™ Video Slot at is based on the Marvel comic by the same name and is the sequel to the ever popular Jack Hammer™ Video Slot . This online video slot has 5 reels and 99 lines and has features which include wilds, sticky wins, free spins and multipliers. The wild symbol replaces all symbols except the scattered Free Spins symbols. It also appears during the free spins as a random wild. Jack Hammer 2: Fishy Business features Sticky Wins, whenever they appear the reels will remain in place and the other reels will spin again. This continues until there is no more winning combinations. Five or more Free Spins symbols will trigger the free spins, five will award 10 free spins and that number rises to eight or more free spins symbols awarding 20 free spins. There is also a two times multiplier attached to the free spins. Inspired by Ancient Greece, this new Net Entertainment Online Slot Machine offers three muses leading players from a seaside village in the main game all the way up to the giant Mount Olympus in Free Spins. The three goddess characters represent art, music and literature and each has its own Wild feature. Muse: Wild Inspiration is a 5-reel, 3-row game with 25 fixed bet lines, which features one Wild Inspiration symbol that includes three different Wild features; an Expanding Wild, Sticky Wild and x2 Wild. Players are able to experience rich and colorful animations with Wilds to boost excitement on the reels that are substituted for the highest win combination on a select bet line. 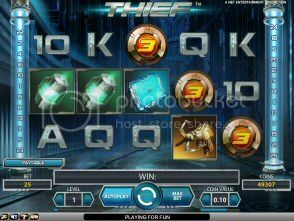 Thief Video Slot takes you from the rainy street of the main game to the upper levels of a hallway and a vault found in the Free Spins modes. The game offers features such as 2 Free Spins modes, Expanding Wild symbols, and a Diamond symbol that pays out up to 5000 coins. Expanding Wild symbols add extra excitement. When the Expanding Wild symbol is part of a bet line win, the symbol animates and expands to reveal a thief scaling the side of a building. Adrenaline Free Spins energizes the gameplay and is activated when 3 Adrenaline Scatter symbols appear on the reels in the main game. Adrenaline Free Spins features an extra symbol called the Diamond symbol, with a maximum payout of 5000 coins when 5 Diamond symbols appear on a bet line! With Adrenaline Scatter symbols, and a special Diamond symbol on the reels, the chance for massive wins is undeniable. Lucky Angler offers you non-stop animations throughout the entire game. The reels show an underwater view of a frozen lake with fish swimming around behind the symbols. 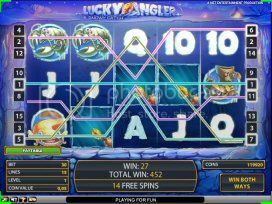 The animations on Sticky Wild symbols are another eye-catching innovative animation only found in Lucky Angler™: A Snowy Catch. When a Sticky Wild symbol completes a winning bet line the symbol animates as if a fish has been hooked and reeled in. The symbol then freezes into an ice cube and sticks to the reels. In the main game you take a spin of the reels in the sunshine, while in Free Spins players spin for wins in the moonlight. With all the animations in Lucky Angler A Snowy Catch, is sure to entertain you with every spin of the reels.